This version is worked in a DK-weight yarn at 6 stitches/inch for a sturdy, but flexible, fabric. To prevent potential color changes between skeins, alternate one round each from two skeins of yarn. This skirt is designed to have about 2″ (5 cm) negative ease around the waist and upper hips for a slimming fit. Four darts shape the taper from waist to high hip, then purl stitches are added between 20-stitch lace “pleats” to provide flare for the lower edge. The length of the skirt can be adjusted by working more or fewer inches after finishing the last pleat increase round. 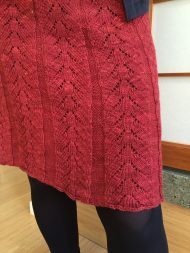 Plan on purchasing extra yarn if making a longer skirt.